IDF official reveals that shots could be heard in boys' recorded hotline call, rifle was found near burnt car on June 13. 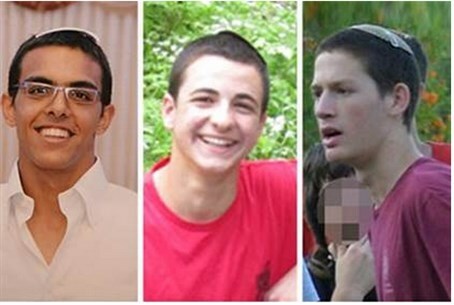 Israeli security forces increasingly believe that terrorists murdered yeshiva high school students Naftali Frenkel (16), Gilad Sha'ar (16), and Eyal Yifrah (19) shortly after their abduction, according to evidence revealed Tuesday morning. Later Tuesday, the IDF and security forces will discuss options, as officials weigh how to both dilute the 15,000-strong IDF force estimated to be currently carrying out operations in the Palestinian Authority (PA) on the one hand, and continue its crackdown on Hamas and search for the killers on the other. A senior IDF officer told Arutz Sheva early Tuesday that since "Operation Brother's Keeper" began seventeen days ago, 419 Palestinian Arab terrorists were arrested total - including 56 terrorists released during the 2011 Gilad Shalit deal, 276 active Hamas terrorists, and 12 Hamas leaders. More than 2,200 homes were searched, and two radio and television stations were closed. Meanwhile, a manhunt continues for terrorists and prime suspects Marwan Kawasmeh and Amar Abu-Eisha, well-known Hamas terrorists operating in the Hevron area.